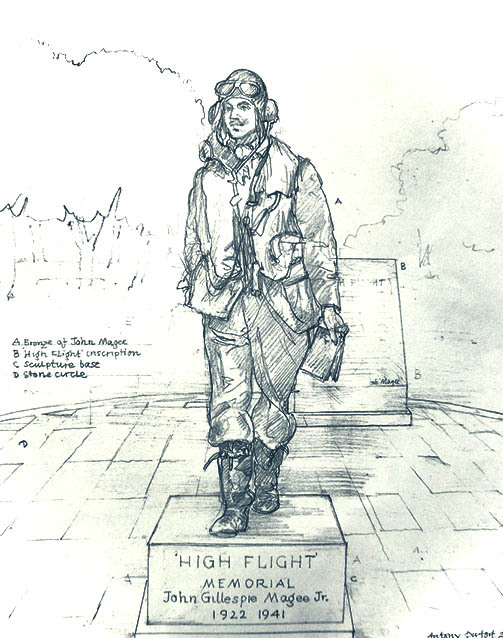 (Above) Sketch of the proposed bronze statue of John Gillespie Magee Jr by Anthony Dufort. World War II pilot John Gillespie Magee Jr. is a historical figure underlying a major character in A Day in Eternity. He was made famous by his sonnet, titled “High Flight,” about the mystical experiences many pilots have while flying. Now he is being commemorated by a nine-foot bronze statue, memorial park, and visitor’s center in the village of Wellingore, Lincolnshire, UK. Wellingore might seem an unlikely home for the tribute to John Magee except that he was billeted with the RCAF No. 412 Squadron there in October 1941. On the eleventh of December, he and eleven fellow squadron pilots took off from RAF Wellingore to practice formation flying with a group of Spitfires thirty miles to the north. On the way back to the airfield, the squadron chose to descend single-file through a small hole in a dense cloud bank. John was the third pilot to ‘whipcrack’ through the hole. He did not have time to heed the warning to miss the oncoming Oxford Trainer from RAF Cranwell, nor was there enough altitude to safely parachute to the ground. He was 19. Magee had written “High Flight” nearly four months prior to his death. At that time, he was stationed at RAF Llandow in Wales training on the Spitfire. The sonnet represents a two-year struggle to fly unfettered over Great Britain. He was an American citizen who had been raised in his mother’s homeland of England, but when he visited the United States in September 1939 at the onset of Britain’s war with Germany, he was prevented from returning to the place where he’d fallen in love. He had enlisted in the Royal Canadian Air Force in September in 1940 and spent the next nine months either training as a pilot or waiting to train. On the eighteenth of August 1941, he’d climbed into a Spitfire and flew to 30,000 feet. The feeling of euphoria, coupled with the satisfaction of achieving his goals, inspired the poem. “High flight” captured his spirit of childlike wonder and wisdom beyond his age, which may be why it has resonated with countless pilots for more than seventy-five years. Magee was buried in the Holy Cross Cemetery at Scopwick in Lincolnshire, England, near where he had crashed. The first and last lines of “High Flight” were engraved on his headstone, but there exists no other physical landmark of his brief life and poem. It is for this reason that the memorial project was conceived. 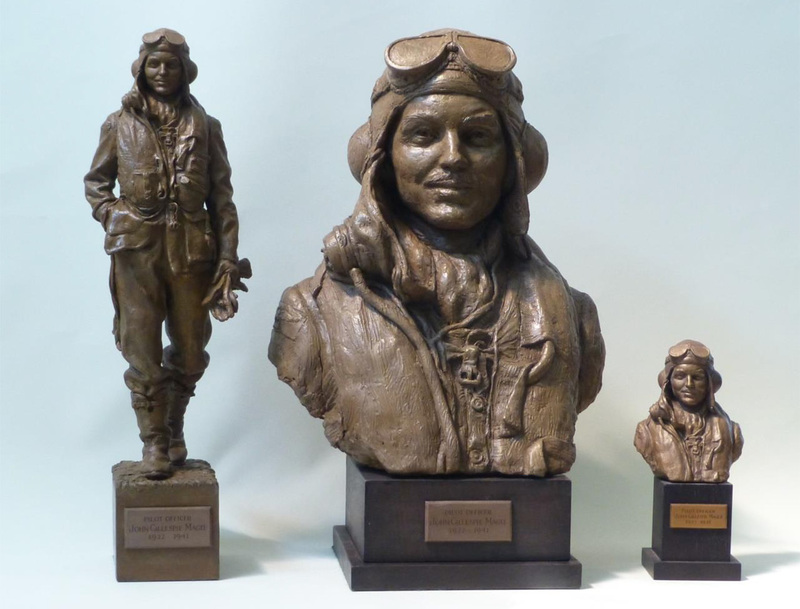 The village of Wellingore was chosen for the statue’s home because it is the origin of Maggee’s final flight. Celebrated artist Anthony Dufort, who has sculpted portraits of royalty, civic leaders, and religious figures, was chosen for the project. The final sculpture of the pilot is expected to open to visitors by the autumn of 2019. The memorial park will be added to the local trail of aviation history that includes a number of RAF sites, such as the site of the Battle of Britain Memorial Flight at RAF Coningsby. Anthony Dufort’s preliminary bust of John G. Magee was recently unveiled (July 2017). Dufort paid meticulous attention to the equipment and clothing worn at the time. 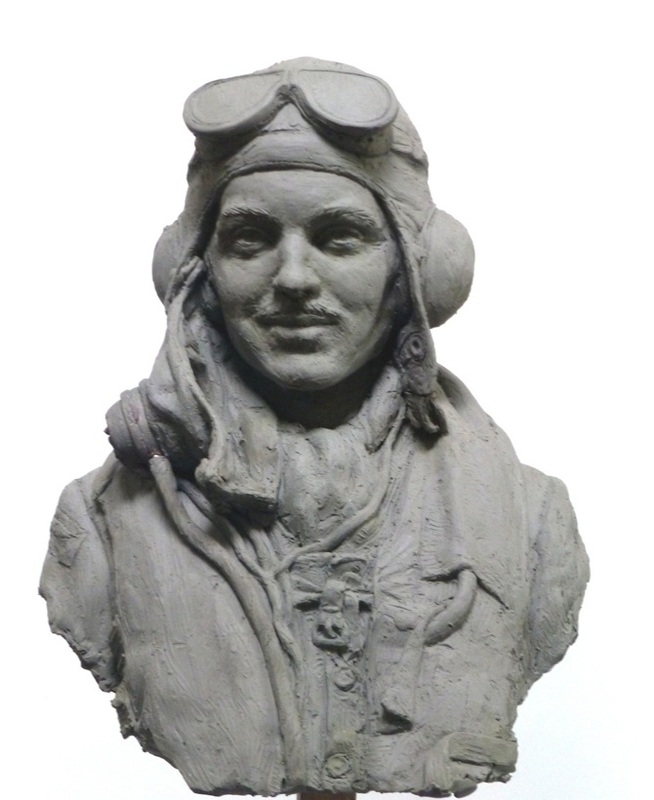 Dufort’s preliminary bust of John Magee was recently unveiled at the annual Royal International Air Tatoo by generals from the Canadian, United Kingdom, and United States air forces to honor the three countries that can claim him as their own. To support our fundraising campaign, sculptor Antony Dufort has permitted the Foundation to make available copies of the maquette model of the statue and the bust of John Magee as Limited Edition bronze castings and as unlimited jesmonite casts.